Just recently, the Syrian Arab Army (SAA) and its allies fought their way to an air base on the outskirts of Deir ez-Zor, an oil-rich region that has been besieged by ISIS for years. Meanwhile, the Syrian Democratic Forces (SDF), a U.S.-backed force made up mostly of Kurdish and Arab fighters, has also just launched separate attacks against ISIS in the north of Deir ez-Zor in an operation to capture areas east of the Euphrates river. The SAA forces advancing on Deir ez-Zor include Iranian-backed militias, as well as Hezbollah, Reuters reported. The Guardian also recently reported that Russia was providing these troops with air support, meaning any plans for U.S.-backed forces to confront these militias could potentially amount to a confrontation with Russia. The U.S. has been providing strong air support to the SDF in other parts of the country, too, and has not shied away from striking Syrian government forces throughout 2017. The U.S. has also stepped up its material support for the SDF and just recently provided these fighters with brand new armored vehicles. The U.S. has a history of avoiding direct confrontations with strong militaries that are backed by world powers. 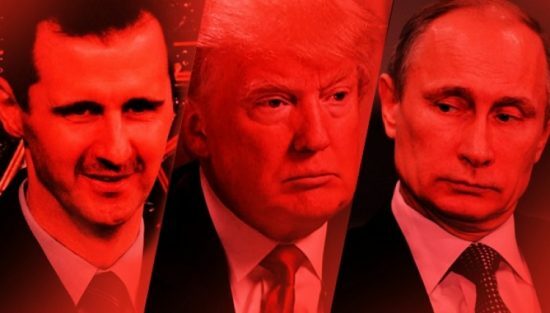 With this likely strategy, America’s proxy forces can continue to act as a buffer against Assad’s looming victory in the Syrian war and potentially give some of the spoils of the region to the SDF so they can operate with financial independence from the U.S.
That being said, it is not clear that the SAA and Iranian-backed militias, independent of Russia, will just sit on their hands and allow these forces to illegally take their territory. After all, why should they? How the U.S. can even be involved in this land-retrieving process is mind-boggling beyond belief, as it has no legal basis to conduct operations in Syria in the first place.